Six years in Blog-o-sphere. I am super-duper excited! It sounds like yesterday I started writing at my blog, and I never thought that time would fly this fast. The journey from an unknown writer to the compiler and editor of two books is exciting like heaven, and I wish this journey continues forever till eternity. This would not have happened without the constant support of my sweet mom, my wonderful wife, my other family members, my editors – right from Vinit Bhai (Uff Ye Emotions 2 Editor) to all the eight wonderful sweethearts I have worked with so far, my wonderful publisher Sachin and PG, my blogger friends for staying with me right from day one – Leo, Zainab, Rachana, Jingle, Simran, Ayushi, Pranali, Aish, TF, Saru, Brian, G-Man, Amity, Vibz, Nanka, Scribbling Gal, Dreamy Girl, Cloud Nine, Sri Valli, Panchali, Norman, Ellecee, Sulaiman, Namrata, Anita and my anonymous readers whose emails I always treasure. Thank you all for making this journey special. Special thanks to IndiBlogger, for the grand platform, to Blog-a-Ton, for everything I own from them and to BlogAdda for announcing my name to blog-o-sphere in 2010. I heartily congratulate you Sarav for not only completing six golden years of blogging but achieving more than that. Few Miles, a perfect epitome of love and romance won my heart right from the first time I visited it. Every memory of it is still fresh in mind and it feels good to revisit them every now and then…celebrating our friendship. It’s not just a blog but a beautiful home of emotions weaved through words alone. The best part…It’s been five years and we still continue to cover miles after miles together. I feel fortunate to be part of this wonderful journey. Wish you many many more success miles to cover in coming future. for me to realize its liveliness? Life is beautiful because it is made up of people albeit some are good and some are bad, while some are just amazing and I was lucky enough to meet two of the most amazing people, yeah Sachin and Sarav. When Sarav asked me to write some words on the occasion of 6 years of Few Miles, an incredibly well constructed blog with posts that shall make you revisit it every now and then, I felt like a tyro in front of this humongous blog. If it was not for the efforts of Sarav, Shades Publications would have been still crawling. No doubt Sachin and I were always there from its inception, but it was Sarav who brought about a change by his witty imaginations and methods. On this occasion of 6 years of Few Miles, I wish and hope that shades shall walk a few more miles and may be till eternity in the hands of Sarav and his team. Thank You Sarav for everything, a prolific writer but more than that an incredibly great human being. I wish you all the success and happiness in your life. As a token of friendship, I have hosted a very small giveaway on Goodreads. The giveaway is open for all Indian Residents. They giveaway closes on November 30, 2015. The results will be announced on Goodreads and the book will be sent to the winners. I love comments. I will be back with an interesting post soon. 500th post. It sounds like a dream, and yes, it is a dream! The dream of a writer, who dedicates his words to someone special in his life, and lives in those words. The journey, so far, is a mix of ups and downs, smiles and tears, learnings and mistakes, love and hurt, and what not… still it is a sweet one. Few Miles – the best part of me – may not be the best written blogs on blog-o-sphere, but of this, I’m sure: the words are from my sweet little heart. It must have touched the heart of the readers and made them feel good, and to me, this has always been enough. My wife is feeling better now. She is back to Germany, and we celebrated our second anniversary, last Sunday. “I’m all yours”, short story co-authored with Simran Kaur of My Friendship, is getting published in the book “A Little Chorus of Love”. This is my 6th book as a contributing author. Few Miles turned five. My friends and I celebrated it in a special way on my blog. And this is my special 500th blog post. When I’m happy, I want everyone to be happy. Are you ready to be happy? Congratulations! Hope the winners got my email. Do acknowledge it to claim the vouchers. Thank you! Also find Flipkart coupons here, if you wish to buy books at the best prizes. And to all my dear friends, a very big Thank You for being there always! Wish you all a very Happy and Prosperous New Year! Have a magical year ahead! Like every year, I do not want to highlight what I did in the past or how I happened to start this blog. Let me keep it short and simple. 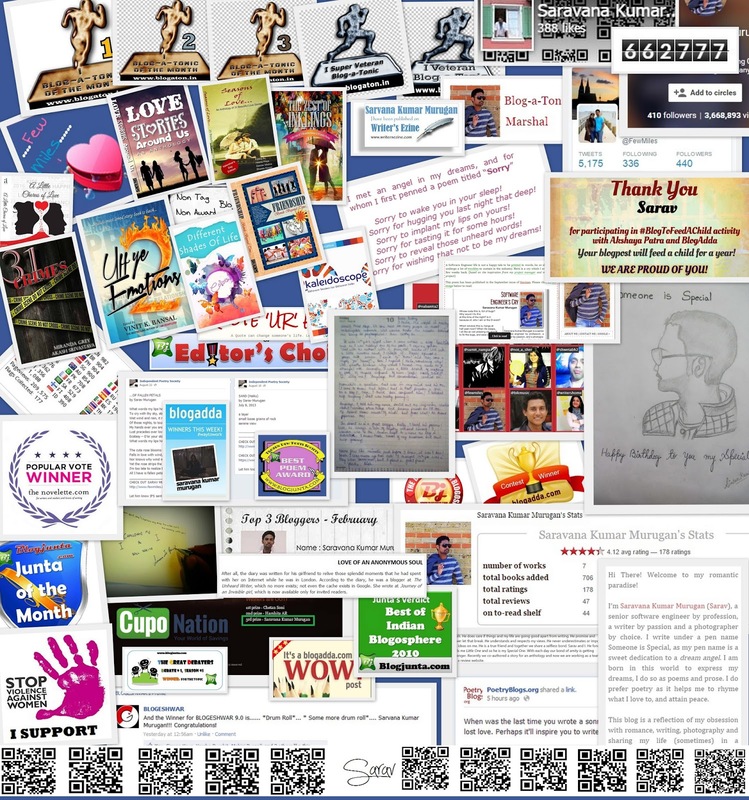 I am thankful to all my readers and friends for keeping me inspired. Without you people, I am sure I would not have come this along. Especially to all the emails and personal comments 😀 I wanted to thank a big list of bloggers for staying with me right from day one – Leo, Zainab, Rachana, Jingle, Simran, Ayushi, Pranali, Aish, Saru, Brian, G-Man, Amity, Vibz, Nanka, Scribbling Gal, Dreamy Girl, Cloud Nine, Sri Valli, Panchali, Norman, Ellecee, TF, Sulaiman, Namrata, Anita and the list continues…. Special thanks to IndiBlogger, for the grand platform they provide, to Blog-a-Ton, for everything I own from them and to BlogAdda for announcing my name to blog-o-sphere in 2010. Many of my friends scolded me to be regular and even requested umpteen times to complete my book. This year, I promise, I will complete the books and get it published. I will post on all Sundays no matter however busy I am or I will be, and of course, I will write poems too, okay? Deal? As a token of friendship, I want to host a very small giveaway FlipKart Vouchers worth (500, 300, and 200 INR) sponsored by me. The giveaway is open for all Indian Residents. They giveaway closes on 10-Jan-2015. The results will be announced in a separate post and the vouchers will be emailed to the winners.